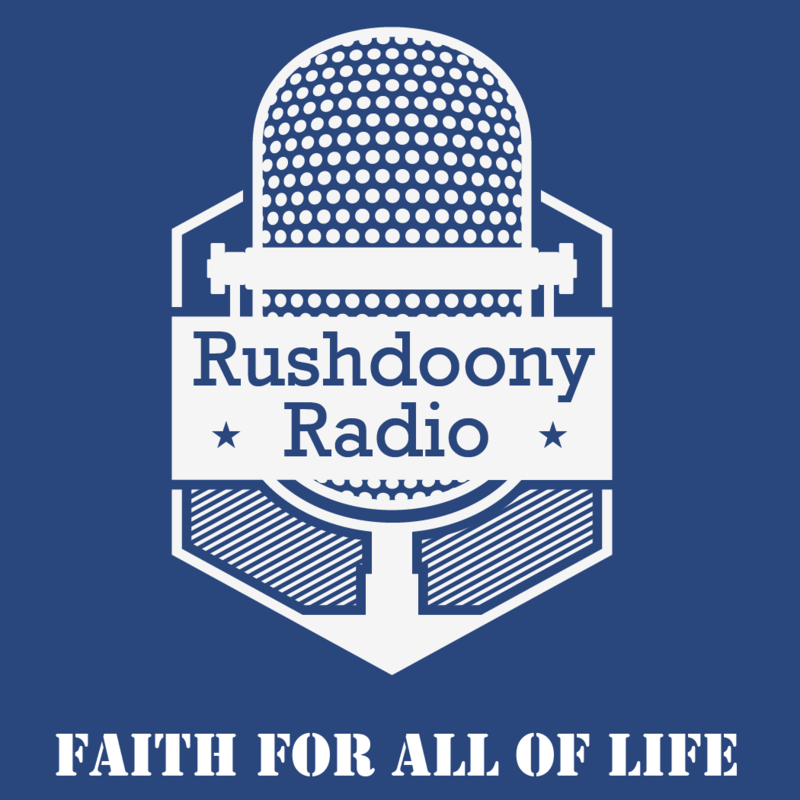 R.J. Rushdoony: 01:43 Our subject today is the tithe. To most people, this is a humdrum subject, but in reality, it is a very explosive one. In the Soviet Union, for example, there is technically a law guaranteeing freedom of worship. There are a number of churches, a limited number, permitted to operate, but even though the law specifically guarantees freedom of worship it prohibits pointedly any discussion of the things that I shall treat this morning. There is a reason for it. While most people in our country have no awareness of the explosive significance of the tithe, the Marxist do. R.J. Rushdoony: 02:49 The tithe was once a requirement of all Christians from the days of the early church. As a matter of fact, it was, through the centuries, paid in produce in farming communities so that a routine part of the landscape in earlier days was the tithe farm in farming communities, where the farmers brought their tithes. The [inaudible 00:03:19], as far as the Catholic church was concerned, required the tithe on pain of excommunication. It was required in Protestant circles. The Lutherans, Reformed, of Calvinists, and the Church of England, as well as the Church of Scotland. It was universally required, but towards the end of the 18th Century, it began to be dropped as a requirement. From the French Revolution on, it has been largely dropped. R.J. Rushdoony: 04:03 The very fact that the disappearance of the tithe and the French Revolution tend to coincide in dates should make us sit up and wonder, “What is the connection?” In this country, it was a required in many states by law and when in 1785 Virginia passed a law abolishing the requirement of the tithe. George Washington wrote to George Mason expressing his distress at the new legislation. R.J. Rushdoony: 04:45 Now, to analyze the tithe first before we go into its significance. The tithe, of course, appears very early in scripture. Abraham tithed a 10th to Melchizedek, and it was nothing new in his time, so it quite obviously went back to the direct revelation of God to Adam and to Noah. The laws of the tithe appear in Leviticus 27, verses 30 to 33 and Numbers 18:21-24, 25, and 26. Deuteronomy 14:22-27 and Deuteronomy 26, verses 12 and 13. There are other references to it. R.J. Rushdoony: 05:42 Now, there are three kinds of tithes referred to in the law. The first is the Lord’s tithe. This went to the Levites who tithed a 10th of it to the priests. Second, there was a festival tithe. This festival tithe was to be sent by the family in rejoicing before the Lord. The only amount of it that was not spent upon themselves was that which included the Levite, in that the Levite in their midst was to receive some portion of it. This depended on the individual. He was to include the Levite in his rejoicing before the Lord. R.J. Rushdoony: 06:42 We would call this a vacation tithe. Except that the significance then was not merely rest and recreation, but a religious rest and recreation. It was not only to be used in pleasure but pleasure that had a religious overtone. It was to be a means of rejoicing in God’s goodness. The third tithe, which was every third year in a cycle of seven so that it was the third and the sixth years was to be a poor tithe to be shared with the local Levite and, in particular, helpless foreigners who were stranded in their midst, orphans, and needy widows. R.J. Rushdoony: 07:49 Now as we analyze these tithes, first of all, the tithes set forth God’s sovereignty. God is absolute Lord and Creator, is landlord, so to speak of Heaven and Earth, required for himself a tithe as his tax on man. Now, as the tithe was taken God was gracious to man so that a man if he tithed his produce or the flocks of his field was to tithe every 10th, literally. Thus, if he had 16 cows he was to run them through the gate or allow them to come through the gate and to mark the 10th one, let us say, with red paint. The 10th one was the Lord’s. This meant if he had 19 cows or 11 cows or 10, only one was the Lord’s so that actually it amounted to less than a 10th. R.J. Rushdoony: 09:10 If, however, he decided to make the tithe a monetary one, that is to sell and to give in the form of money or to retain it and to give the price, then he had to add a fifth to the price. Even then, this did not equalize it fully, so that God in computing the tithe was generous to the farmer or to the cattleman. If it was a monetary tithe it was strictly a 10th, but if the farmer retained it for his use he added a fifth of the cost of the 10th cow or the 10th bushel or the 10th box of fruit. The second tithe, which was to be used in rejoicing before the Lord, actually involved no additional 10th in that it was to be given of the first fruits of the flock. That is the first born of the flock and of the first fruits of the field, which were to be consecrated under God. Then he was to use them, either the produce or the money that came in from it to rejoice before the Lord. R.J. Rushdoony: 10:38 The poor tithe, as we have seen, came every third year of a cycle of seven. The seventh year for the farmer was to be a sabbatical year. There was to be no pruning, no sowing, no gathering. However, in the seventh year, there could be a gleaning. That is, the widows and the orphans could be permitted to go into the field and take what they wanted. The purpose was that the earth be rested and refreshed. It had an invaluable purpose in soil conservation in allowing the land to lie fallow. It also is specified as helping the beasts of the field so that the birds and the wild animals prospered thereby, and the whole balance of nature was furthered and retained. R.J. Rushdoony: 11:49 Now, tithing meant proportionate giving. As Deuteronomy 16:17 says, “Every man shall give as he is able.” Now, Saint Paul quotes the same verse when he specifies Christian giving. A lot of people have said, “Well, you see, Saint Paul obviously does not want Christians to tithe or require them because he says, ‘Let every man give as he is able. '” But people who say this do not know that Saint Paul was quoting the law of the tithe. The whole point of the tithe was that it did not put an undue burden on the rich or on the poor. In other words, the tithe, a 10th was required of all equally. This meant then that the burden of the Lord’s work did not fall simply upon the rich or upon those who were zealous in giving. R.J. Rushdoony: 12:58 In this respect, it is significant to look back a couple of centuries to the beginnings of Methodism. John Wesley did not believe in tithing. He spoke against it, and he could point with pride to the fact that the average follower of his movement, which became, after it broke with the Church of England, Methodism, gave far more than a tithe. But what was the consequence? Some of the evangelicals within the Church of England called attention to it in his own day. R.J. Rushdoony: 13:37 It soon meant that those who are zealous and thoroughly dedicated were giving far more than a 10th and the burden was falling upon a handful in each congregation, and the rest were not giving their share. The burden of giving fell upon a handful of the rich and a handful of the poor. In other words, those who had faith, rich or poor. Every time there was a need for funds these were the people who gave and the rest did not give but a very small fraction. R.J. Rushdoony: 14:22 This, of course, meant unfair giving. It meant that the church was caring a great number of parasites. The law of the tithe prevented this. It meant proportionate giving. It meant rich and poor gave on a proportionate basis. It established a fair pattern for all. Moreover, the tithe established a concrete lawful basis for dealing with God. As Samuel Rutherford, one of the great Scottish churchmen said, “I am persuaded that Christ is responsible and law-abiding.” What does this mean? R.J. Rushdoony: 15:10 He declared, “I believe that Christ will respond to those who keep his law and he will keep his law in relationship to them. Those who will honor God will not rob him of his tithes and offerings.” God says, “I will open the windows of Heaven and pour you out a blessing that there shall not be room enough to receive it.” Again, as GH Pember, an Anglican rector said some generations ago, and I quote, “We know generally that the grace of God follows every act of direct obedience on our part. If we search out even the most minute commands of his law and do that, if we show that we would not have a word uttered by him fall to the ground, we testify both to ourselves and to others that we do in very deed and not in word only recognize him as our God and our king. Nor will he on his part be slow in acknowledging us as his subjects, as those who have a claim upon his aid and protection.” It is important, finally, to add this point. The tithe was not regarded by the law as a gift to God. No man could say he was giving a gift to God until he gave above and over the Lord’s tithe. These were called freewill offerings. The freewill offerings there then were only the gifts above and over a tithe. Deuteronomy 16:10 and 11, Exodus 36, verses 3 to 7, Leviticus 22:21, and other passages refer to freewill offerings, and this means more than the tithe. R.J. Rushdoony: 17:28 Now, why is the tithe such an explosive subject? In Iron Curtain countries, why is it that after guarantee technically freedom of religion they prohibit anything that points to the old biblical tithe? This would be illegal preaching by even the most licensed of the Soviet preachers. It would immediately mean the concentration camp. The reason is a very obvious one once we recognize a fundamental principle. The tithe took care of the basic social functions of any society. Education and welfare. R.J. Rushdoony: 18:22 As long as you had the tithe, faithfully observed and required, whether it was in the Old Testament period in the early church, in the colonial period, or in Europe, medieval Europe or reformation Europe, the basic social functions were taken care of without the state having anything to do with it. Education was taken care of by the tithe. Welfare was taken care of by the poor tithe. Every important social function was met by the tithe. The state, therefore, had only a limited area of jurisdiction, and as a result, the tax of the state was so insignificant that it was scarcely kept. Is it any wonder that God, in 1 Samuel 8, in speaking to Samuel in Israel said that the tithe, which acknowledged his kingship, would be replaced when they cast aside his kingship in his time with a Totalitarian regime? Now, God speaking through Malachi says, “Bring ye the tithes to the storehouse,” so that the law of the tithe places a responsibility upon the people of God. When God says, “Bring the tithes to my storehouse,” he meant literally this; first of all, bring them to the appointed place, whether it be in food and produce or in cattle or in money. It has to be my storehouse. It cannot be the storehouse of Baal or false prophets or those who are not faithful to their responsibility in the use of the tithe. R.J. Rushdoony: 20:38 So that the tithe was, first of all, required and second, it had to go where it would be used for the Lord’s work. This placed the responsibility, therefore, on the people who tithed to see that their money went to the Lord’s work, to education, to welfare, to various social functions under God so that they were not tithing, therefore, if they took it where it was not properly used. It had to be truly God’s storehouse. It is not a tithe if it is misdirected. A few generations ago, Lansdale of the Church of England said that the person who is against the tithe is a spiritual anarchist. This is quite a bold statement, but if we analyze its significance we will see that it is right. He is a spiritual anarchist and a political totalitarian, we might add. R.J. Rushdoony: 22:07 Today the state has assumed the basic social functions of society, and it is requiring far more than a tithe to maintain them. The state has moved into education and welfare not in order to fulfill a responsibility under God but in order to use them as stepping stones to power. Totalitarianism is the result. It is not enough to be against the state’s interference in education and welfare. R.J. Rushdoony: 22:46 It is not enough to oppose the state’s control of these basic social functions. These functions are necessary functions. They are not being discharged by the state. The state is not performing its duty in education. We are having miseducation. It is not producing a true welfare program. It is not helping widows and orphans, it is destroying them. It is creating a pattern whereby the breakdown of character and dependence on the state is the goal. R.J. Rushdoony: 23:35 When I was in the pastorate I saw what welfare was. Those who are independent have nothing but trouble when through need a widow or an orphan is dependent on state welfare, federal welfare. Everything is done to break down those who have character. The preference is for those who are immoral, dissolute, totally dependent upon those who will look to the state as their God, not to those who briefly and temporarily want help until somehow they can get on their feet. The basic social functions are not met by the state, and the state has no intention of meeting them. The state is after power. R.J. Rushdoony: 24:45 Although it does lead to economic collapse and breakdown ultimately for the state, there is no answer to the problem other than a continuing social crisis, anarchy, totalitarianism until the people of God cease to be spiritual anarchists and recognize the basic social functions must be met. God has provided a law whereby they can be met. We must meet them under God, and step by step strip the state of its pretensions, of its power, of all its claims until it becomes again what it was intended to be, a ministry of justice and no more. R.J. Rushdoony: 25:45 The law of the tithe, therefore, is an important one. It is an area of great neglect and yet a tremendous social consequence. Not until the people of God are ready to reconstruct society in terms of a godly pattern can we undercut the totalitarian pattern. Let us pray. R.J. Rushdoony: 26:22 Our Lord and our God, we give thanks unto thee for the sufficiency of thy salvation of thy word and of thy care. Thou has provided a way for us. Teach us to walk therein. Grant that we as thy people may begin day by day by our living and our giving, the reconstructions of things, and the conformity to thy word that we might strip the present totalitarianism regimes that surround us of their pretensions, of their arrogations, and of their power. That he might render thee thy do praise and power, and under thee have a new birth of freedom. Grant us this we beseech thee in Jesus’ name, Amen.